In his excellent publication, ‘The Ancient Books of Ireland’, Michael Slavin has included the Great Book of Duniry. On page 144 he writes: “We cannot pass this section of our study without mention of a book attributed to the MacEgan family and called the Great Book of Duniry, the Speckled Book or Lebor Breac. This strange religious compilation was written at the behest of the MacEgan family by professional scribe Murchadh O’Cuindlis in the early fifteenth century and was finished around 1411. It gives some insight into the kind of spirituality and theology that informed the learned Gaelic classes at that time. It appears to be heavily influenced by the strict spirituality of the Ceile De sect of earlier centuries known as the Culdees. It includes the Martyrology of Aengus Ceile De and has a set of rules for the Culdees. It also includes sermons on biblical and liturgical matters and many Lives of the Saints. It was consulted by Michael O’Clery in 1629 when he was working on the Lives of Irish Saints. It probably remained at Duniry up until the mid-eighteenth century. In 1769 it was with the O’Daly family in Mitchelstown, Co Cork, and at the behest of chevalier O’Gorman, it was sold some 20 years later to the Royal Irish Academy for £3-13s-8d. It contains 131 vellum leaves with two tightly written columns of each side. Eugene O’Curry estimated that the script would fill 2,000 pages of the Annals of the Four Masters”. 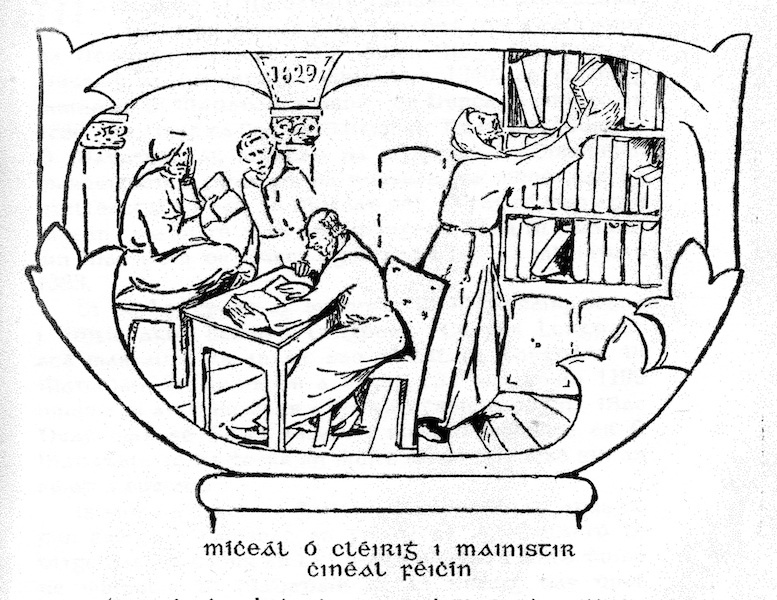 Other authors have also written about the Leabhar Breac – one being Mícheál Ó Conaill who published a book as Gaeilge in 1932 ‘Cinéal Féichín agus Síol Anmachadha’. 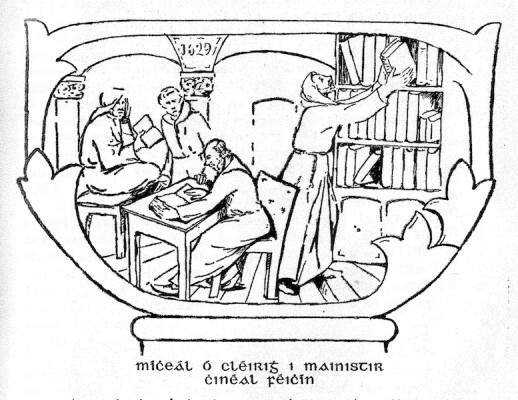 In this he speaks about Micheál Ó Cléirigh’s visit to Duniry to consult the Leabhar Breac only to discover that it was to be found in ‘Árus na mBráthar mBocht i gCinéal Féichín’. Mícheál Ó Cléirigh proceeded to Kilnalahan Monastery in Abbey and writing about this visit Mícheál Ó Conaill wrote: “Í Mainistir na mBráthar mBocht í gCinéal Féichín do sgríobh an Bráthair Bocht Mícheál Ó Cléirigh é seo ag cur síos ar Cheallach thréis é aithsgríobhadh as an leabhar drab ainm ‘Leabhar Mór Dhúnadh Dhoighre,’ an tríomhadh lá de Dheire Foghmhair sa mbliadhain 1629.” The Leabhar Breac was held in the Convent or Monastery of Cinéal Féichín for most of the 17th century.